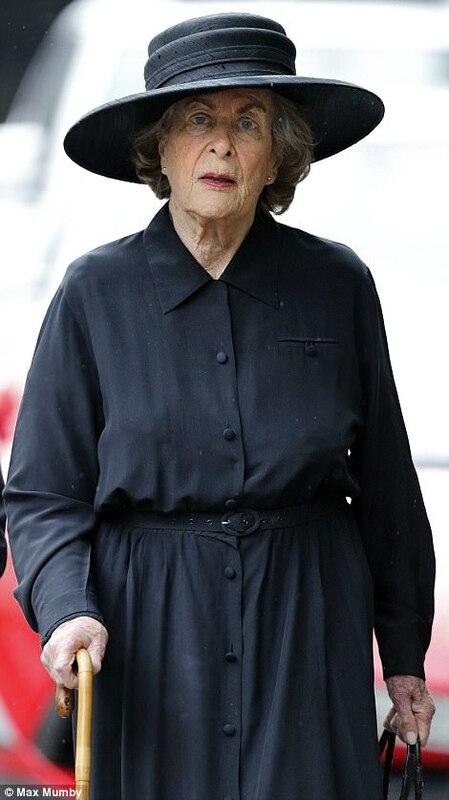 Members of the British royal family attended the funeral of Patricia Knatchbull, Countess Mountbatten of Burma, today at St Paul’s Church in Knightsbridge. The Countess, who was the Duke of Edinburgh’s first cousin, Queen Elizabeth’s third cousin and the Prince of Wales’ last surviving godparent, died June 13 at the age of 93. As one might expect, Queen Elizabeth, Princess Anne, Princess Alexandra, the Duchess of Gloucester and the Countess of Wessex all attended the funeral today in black hats. The funeral was attended by members of the Knatchbull family, many who wore black hats. Photos below are only of Penelope Knatchbull (until today, titled Lady Brabourne), who is familiar to readers here. You can see hats worn by the late Countess’ sister Pamela Hicks here and niece India Hicks here. This entry was posted in Great Britain and tagged Countess of Wessex, Lady Brabourne, Princess Alexandra of Kent, Princess Anne, Queen Elizabeth. Bookmark the permalink. It seems trivial to comment on hats worn at a funeral but since that is our job…..the new countess looks lovely, I like the bow directly centered. The Queen’s hat is great. I love the design on the front. I know Alexandra’s hat is nothing new in style but it is a style that looks wonderful, very Edwardian. Anne’s seems to be stepping up her game this is a nice hat! The other ladies are looking good. I echo the chorus regarding The Princess Royal, very nice. HQ, thankyou for the flashback photos of the wedding of Alexandra Knatchbull. Very nice bridal dress and of course the Mother-of-the-bride looked stunning, but…it also afforded us a look at HM the Queen again. I had forgotten this outfit, perhaps because it was at a more private function. Muted colours, compared to of late, but a very nicely coordinated outfit with a pleasant hat. RTM I wonder?..unconfirmed at the time. HM looked very appropriate for this occasion and the hat was a good choice; the brooch is beautiful as well. I did find it a bit odd she didn’t wear a coat as she normally does. Anne looked great in this new (presumably) cocktail hat, and I think this particular one works very well with her hairstyle. Alexandra looked appropriate for this event too, although the hat design is nothing new for her. Honestly, while I liked her ensemble, I’m a little disappointed Sophie repeated this hat again, making it the third time she’s worn this one in as many months; I would’ve liked to see one of her other black hats out again. No surprise from Birgitte, although she looked good too. Lady Pamela’s hat is an excellent shape and size for her, although her outfit looks more like something Mrs. Hughes might’ve worn while working at Downton Abbey; therefore, it’s not bad, but I think she could’ve done better. India Hicks ties with Penelope Knatchbull for my favorite hat of the day; the rose trim is exquisite, and I really like the veiling on this cocktail hat. The new Countess Mountbatten of Burma looked regal as ever in this portrait hat. The centered position of her brooch is interesting, but she wears it well regardless. While I was a bit fussy about some of the details, overall this was a great showing by all who attended, and I’m certain it was a sad day for the Knatchbull family and the Royal Family. The new countess looks absolutely, elegantly appropriate. I love that dress and hat combo and that perfect diamond brooch right in the centre. The Queen, as always, is perfection. MrFitzroy hesitated to mention this during Ascot week, but as they say, third time is the charm…….is this not the third time in quick succession that HM has worn this particular woven fabric? In pink on Ascot day 3, with self fabric covered hat to match. In aqua on day 4, with the RTM hat. And, now today in black. Each outfit has been lovely, but it is a bit peculiar that the same distinctive woven fabric in different colors would appear in such an abbreviated time frame. Makes one wonder a bit if Ms.Kelly picked up multiple bolts at a bin sale somewhere, and we have yet to see the emerald green and sunset orange versions….. Apologies for making what may seem like a trite observation at a somber time, but it seems this is the first time such a fabric progression has happened in MrFitzroy’s long memory. Interesting. That said, HM looked appropriate — and right on the mark for the occasion — her presence was a mark of the magnitude of the Countess’ passing, as HM does rarely attend funerals personally. All of the royal ladies in attendance were pluperfect. Despite the sad occasion, an elegant and perfectly turned out group. A little side note, makes MrFitzroy feel downright ancient to see India Hicks as an elegant adult woman, when in one’s minds eye she will always be in her youth (and bridesmaid’s gown) — at Charles and Diana’s wedding. Yes, ancient is exactly how I felt when I clicked on the photo of India Hicks! As you say, and so well, all the Royal women looked very nice. I think it is called cloque and it is popular at present. Joel and Son Fabrics who hold a royal warrant ifor fabrics describe it as follows: “understated yet sophisticated, this pliable fabric tailors especially well for a dress, jacket or two piece suit. Team this up with a plain silk crêpe to create an absolutely stunning outfit. Available in a variety of colours.” At about 100 pounds per metre it isn’t cheap but it seems an attractive and practical option for The Queen’s wardrobe especially teamed with her silk print dresses. It’s unusual to see The Queen in a black, lighter weight dress. I wouldn’t be surprised if this dress was made especially for this occasion.I didn’t like the fabric as much in the green dress that the Countess of Wessex wore to Ascot. There it looked a little hot and heavy. Fascinating comment, Kew Gardens. I dug around the Joel and Son website and I think I found the fabric (in dark blue). The Queen tends to wear a lot of silk/wool blends and as this is one as well, it is a logical choice for her. While nosing around the website, I found this- I’m pretty sure it’s the fabric used on the now infamous hat she wore to open parliament. Brilliant website HQ….I could spend hours there clicking away. Elegant and appropriate, each and every hat. A sad day for the royal family. I agree that Princess Anne’s hat is especially attractive and the new Countess looks elegant and lovely, as always. I do love the Princess Royal’s hat. Yes. Best of the best. A very sad day. Everyone looked well suited and booted for the occasion. I’m always struck by how wonderful QEII looks in black and other dark colours. Penelope Knatchbull is a beautiful woman – a wonderful hat and chignon – always complete understatement and refined elegance. Very nice hats. I especially like the Queen’s, Lady Penelope’s, and Princess Anne’s. Everyone looks very nice and appropriately somber/respectful. The Princess Royal’s hat is particularly attractive. Is it new? Yes- I think it’s new. This was clearly a very personal loss for the RF. Agreed with the previous comments that everyone looks good, but appropriately somber, in their own personal styles. I don’t remember seeing Anne in that hat — is it new? Don’t the buttons on HM’s hatband look like they are coming off? The late Countess’s name was Patricia. Her sister in the link is Lady Pamela Hicks. Everyone looks appropriate and I think Anne is wearing a new hat so that is noteworthy. May The Countess Mountbatten of Burma R.I.P. I love Princess Anne’s hat here as well as the Queen’s. No Camilla? Anyone know why?? Is Penelope Knatchbull the lady who wore the beautiful hat at the wedding where Prince Charles escorted the bride down the aisle? If so, she looked splendid in her beautiful hat at the wedding and equally beautiful in her black hat with the front black bow as the only adornment. In fact, all the ladies look suitably attired in their somber hats. Yes- Penelope Knatchbull’s title until the funeral today was Lady Brabourne. She now becomes the 3rd Countess Mountbatten of Burma. Her daughter, Alexandra Katchbull, married last year and that’s the wedding you and Jimbo have referenced. To clarify relations: Prince Philip’s mother was Princess Alice of Battenberg. Alice had 3 siblings- a sister and two brothers. Her youngest brother was Louis, who became the first Earl Mountatten of Burma. It is Louis’ eldest daughter Patricia whose funeral was today. Interesting side note- Alice and Louis’ sister, Louise, became Queen Louise of Sweden. The siblings were all great-grandchildren of Queen Victoria through her 3rd child, Princess Alice. They were all second cousins with the Queen’s father, who of course descended from Queen Victoria through her 2nd child, King Edward VII. Indeed I do… especially since the UK has not yet had a King Edward XII (nor will during my lifetime!). All the women looked beautiful today, especially Lady Brabourne. Just a year ago, June 25, 2016, she wowed everyone at her daughter Alexandra’s wedding, recall?